My family took a trip to Wisconsin Dells and spent a weekend at this resort. Read to find out what we thought of it. Business Description: Mt. Olympus Water Park & Theme Park located at 1701 Wisconsin Dells Parkway in Wisconsin Dells, Wisconsin and offering a variety of attractions ranging from water slides to roller coasters and go karts. My family visited this park this past weekend and stayed in the resort's Poseidon Village. We originally planned a trip to Mall of America this summer. However, when we realized we just didn't have enough money for that, we looked for an alternative. This ended up being Mt. 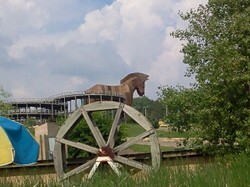 Olympus Water Park & Theme Park Resort in Wisconsin Dells, WI. We made our trip to this park, as planned, this past weekend and, while we did manage to have fun, my overall opinion was somewhat mixed. Our biggest consideration when choosing this park was the price. We spent two nights at the resort, which was roughly $500. However, that price included weekend passes to the water park and theme park and, because of that, seemed like a decent deal. Plus, while the food was kind of expensive (almost $4 for a hot dog), I did like the fact that price was all-inclusive and included all but a couple rides and special access to the resort until 10 p.m. each night (it closes at 7 p.m. for all other guests). The water park was also admittedly pretty nice. I'm not much for water rides. But, my wife and kids love them and there was an excellent selection ranging from "kiddie" pools to things like Poseidon's rage (a pool with 9-foot waves) and, while we probably would have enjoyed it more had it been less crowded (our own fault for going on the weekend), the family did have a good time with these. The theme park, however, wasn't as impressive as it looked when we were checking it out on the web site. Yes, there were quite a few rides. However, the variety wasn't as good as we hoped. My biggest problem with the theme park, in all honesty, was it really didn't seem to be as family-oriented as the water park. Basically, there were some rides designed for younger kids that even my 5-year-old daughter was bored on. The other rides, like the roller coasters, that were really better suited for teenagers and adults and there wasn't much in between. My wife and I had to skip going on the rides we thought we would enjoy because we were afraid they would be too intense for our youngest daughter (we didn't like the idea of leaving her and her sister unsupervised in a crowded park while we rode the rides without them). True to their word, Mt. Olympus did give hotel guests an extra three hours. However, one thing that wasn't mentioned was a lot of the rides still closed at 7 or shortly after so, even though the crowd was smaller, there were still lines because there were fewer attractions to choose from. Even the theme park's petting zoo was kind of a disappointment. It consisted of ducks and goats. The ducks had no interest in being petted and the goats, to paraphrase my oldest daughter, were busy trying to become mommies and daddies (I'll let you form your own picture). We also weren't overly impressed with Poseidon's Village, which didn't seem to be anywhere near as enjoyable as the web site described. The girls, admittedly, liked having a bunk bed to sleep on (rather than sharing a bed like they normally have to do when we are traveling). However, after each of them hit their heads (hard) on the wooden frame, that lost some of its luster. And, outside of the bed, there really wasn't anything overly special about the room. It was pretty much your basic motel room with uncomfortable beds, thin walls (we could actually hear our neighbors open and close their refrigerator) and a bathroom that looked like it was designed for a munchkin. Our room was also located about a mile from the water park/theme park entrance. This, of course, meant an extra mile of walking there and back each time since it was nearly impossible to make a left turn on the Wisconsin Dells Parkway without losing a half hour or more of your life. And, while I'm certain the resort had a shuttle bus, nobody ever took the time to explain to us (or, apparently, any of the other guests in that building) how that worked. The room also didn't seem to be very clean. My oldest daughter found a piece of chewing gum stuck to the side of the bunk bed and her younger sister found pieces of popcorn next to the mattress that went unnoticed. There was also a pretty noticeable squished bug on the wall of the bathroom. Ultimately, given what we spent on the room, I think I would have been better off just getting a room at a nearby budget motel and paying for the park passes separately. One other thing I did have a mixed opinion about was, when we checked in, we were immediately pointed over to their "welcome" desk and, after giving us a small packet, were invited to tour a nearby sister resort the next morning. Despite the woman's claims this was nothing more than an hour-long tour designed to drum up word-of-mouth advertising for the resort, this turned out (as I kind of expected) to be a 3-hour-long timeshare pitch. Granted, there wasn't anybody twisting my arm and the decision to actually go to the other resort was ours. And, we even got a 3-day, 2-night hotel stay out of the deal, though I did have to jump through a few hoops (and pay a security deposit) to get that hotel stay.. It's just the whole experience, which, again, was part of their "welcome desk" seemed a bit sleazy given the circumstances. My family did end up having fun despite the numerous restrictions I mentioned. However, I also think that was more because of a major effort on our part than it was the park itself. As I mentioned, the water park portion of this resort was decent and, if your family likes that kind of thing, it would be worth getting a day pass to do that. However, if you are looking for non-water activities to do as a family, there are better choices in Wisconsin Dells. And, I certainly would not recommend getting a room here, especially in Poseidon's Village, simply because based on my own personal experience, I'm not convinced it is worth the extra money.